You’d think a gnarly, technical track would lend itself to the experienced veterans, but on a crazy night, two relative newcomers logged solid and consistent rides to grab their first podium finishes ever on 450s. Both were riding Hondas. One was GEICO Honda’s Eli Tomac, who grabbed second, and the other was Lucas Oil/Troy Lee Honda’s Cole Seely, who took third while filling in on the Honda Muscle Milk team. We talked to them both after the race. As for 450 race winner Ryan Dungey, we’ve got a video interview with him headed your way. 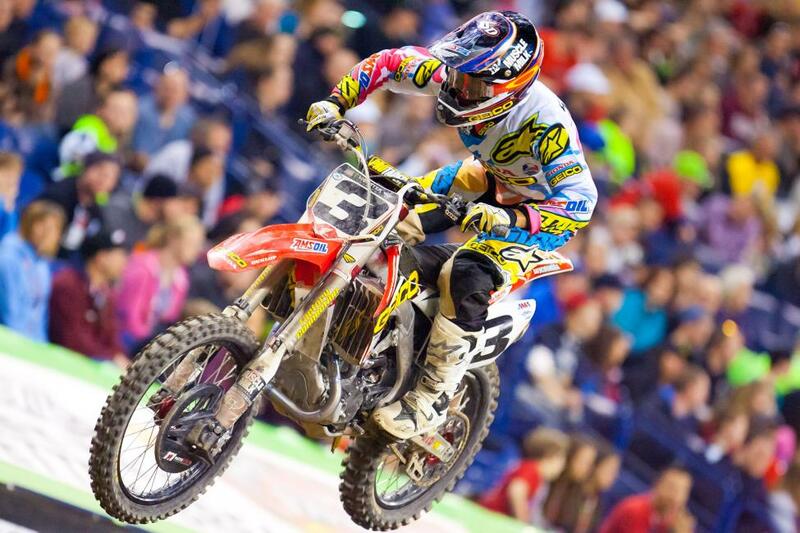 Racer X: Long season for you. Take us through what this feels like right now. Eli Tomac: For me it’s just been a big downhill really. Starting with Anaheim with that crash and then trying to come back from that. It was rough. I feel like I’m just coming back to my full potential, I would say, with strength, and feeling to where my shoulder isn’t bothering me on the bike, too. And with that I was also struggling just to be comfortable on the track. I just wasn’t riding like myself. So I feel like I’m getting somewhere close to where I left off on my 250. What was different about tonight? I guess just really good starts, good qualifying race, and just stopped making mistakes because this track was really tough. Talk about the track a little bit. It was probably one of the ruttiest tracks I’ve ridden besides Seattle. It’s about even with Seattle. It’s crazy. 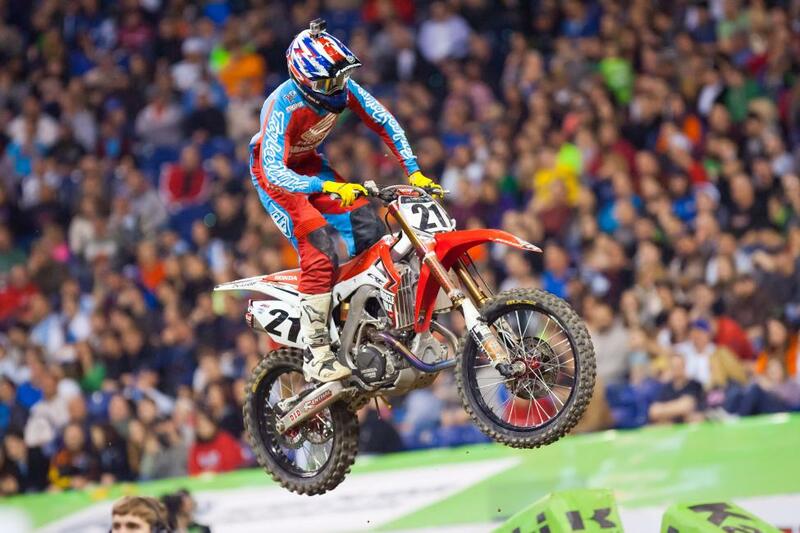 Well, this was the Eli Tomac we know. Maybe it took some traction and some ruts? Because all day long you were good. Yeah, I just think I’m starting to come back around. Like you said, practice did go well, I was fifth in the first one, fourth in the second one. That made me know that I could be right there. Then the heat race came around and I got a nice holeshot, which was really sweet. I’m just trying to prove to everyone that my starts aren’t as bad as they all think! I just need a little more horsepower [a 450] to pull me off the gate. In the main, I got another good start, but I actually flinched, I was so psyched, maybe I was amped too much! Got a pretty good start, I was trying to make moves on [Mike] Alessi on the set of whoops by the mechanics; I tried it like five times! We were both trying to get over that wall and he just wouldn’t give it up. I did start to get a little bit tight, this track, you couldn’t really ride it totally aggressive and out of control or it would bite you. It was sticky and there were pockets that would throw you over the bars like Mike—I saw it and that was pretty wild. It was a track you had to be patient on. You were closing on Alessi, and there were two sections where you just clunked it, and clunked it. It cost you some time. Before lap 10 I was feeling awesome, and after that I just settled in. And Mike, honestly he was going second place speed—he was riding good! I can’t take anything away from him. We talked last week and you said if everything went well you wouldn’t have to go to SoCal to test, but Atlanta didn’t go well. So did you go to SoCal? I did go to SoCal on Monday and Tuesday. Felt like I wanted to jump off a cliff, but it did pay off! Racer X: Your first 450 race this year and you get on the podium. 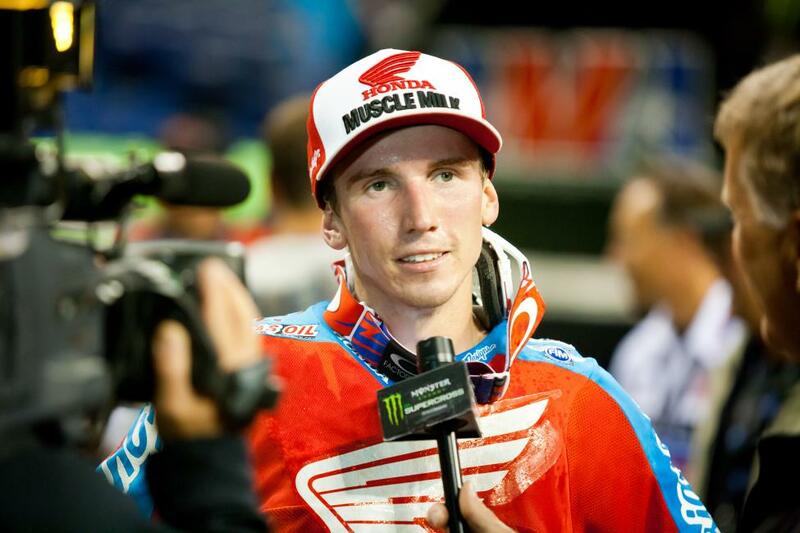 Cole Seely: I had a good feeling tonight, that’s why I agreed to do this. I’ve only had two days on the bike. Just rode it Tuesday and Wednesday and we knew a storm was coming on Thursday, so we kind of got in those two days as best as we could and got ready for the weekend, pulled the trigger and came out here. Obviously the 450’s a bigger bike, but is it a lot different than your 250? The chassis is the same. A lot of the basic parts are the same. I really, really like the new chassis. I liked it last year when I rode the 450 just for fun in the hills or at a local track. I was excited for the new chassis to come to the 250. I really like the way it’s set up. It’s definitely a bigger bike, more power, you have to respect that and not try and ride it like a 250, which I don’t like to do. I don’t like to be up in the high RPMs; I like to lug the bike. I think the 450 really lets me do that. It suits my style better. Tell us about the race. How the start went. Obviously that pileup didn’t help. Did you see it? I saw it on the replay. I almost kind of caused it because [James] Stewart got into me and then bounced off me and went left into [Josh] Hill. I put my head down. I knew I was in 5th or 6th and made some passes on some riders. Me and [Justin] Brayton actually were kind of pacing off each other. He was in front of me and I think he could feel my pressure. We ride a lot together and train a lot together so that made it fun for me and kind of eased me up a little bit. I kind of got that test track feeling, so that was good; got around him and set my sights on Alessi and Tomac and was clicking away at them. Then Alessi made a mistake, went down. I actually made a mistake when he did and I was in the tuff block, had to back out of it and go. That’s how I got into third, and then I just looked back where [Ryan] Villopoto was and tried to manage that gap as best I could on those last five or six laps. 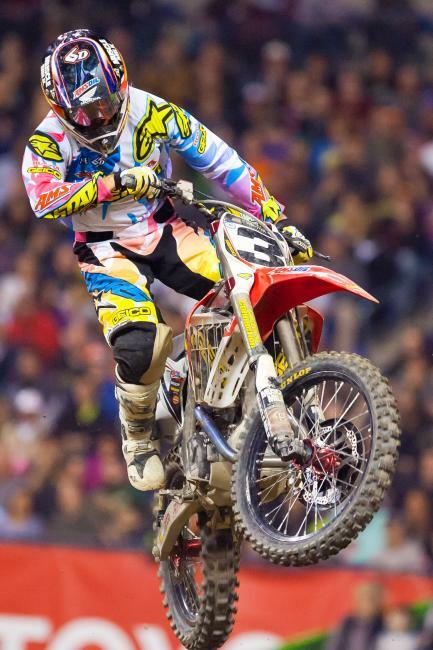 A lot of people might think why is he racing the 450 when he is so close in the 250SX West Region Championship? That is a question that I do get asked a lot. I’m sure a lot of people are thinking that. But I’ve got to think about the future, too. It’s my last year on the 250. I’ve got to open up some eyes on this 450. I think a lot of people already know that I’m fast on it but I’ve got to prove that and really set myself up for a ride next year and have some ground to stand on when it comes time to sign a 450 contract. How did the process come about? Actually I was watching the race on Saturday, saw [Justin] Barcia crash and knew he was out. And I’m like, “I bet I’m going to get a call tomorrow.” I didn’t get the call until Monday. I was actually just hanging out and my team manager was like, “Hey, I know you were talking about going to Indy to watch,” just because the Lucas Oil Stadium, that’s our title sponsor on our team. I was like, “Yeah, still thinking about going.” He’s like, “Well, you want to go race?” And I’m like, “Sure, let’s do this!” Anytime you get a chance to ride a factory bike I would say jump on it because it’s a lot of experience to gain and it definitely helps you out, I think, in the long run. We’re kind of going race by race. We didn’t set a race on when I’m going to hop back on. Obviously we’ve got to get a couple weeks to get used to the 250 again before Houston. We’re going race by race. One of the main things why I decided to ride is when Dan [Honda Muscle Milk team manager, Betley] called me he said, “Let’s just have fun.” And that took a lot of pressure off me instantly. I still put a lot of pressure on myself to do well and show people that I am fast on the 450, but it’s a very easy-going atmosphere over there at Honda. What do this do going forward for your 450 career? It just kind of proves that I can ride the bike and I have skill and talent to ride it. It’s definitely some ground to stand on for next year.